EA is a "Worst Company in America" Semi-Finalist! Consumerist's always-entertaining "Worst Company in America" showdown is on right now, and a video game company is making a rare appearance alongside the likes of Bank of America and AT&T. 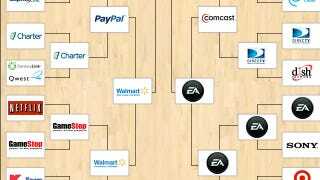 That company is Electronic Arts, which while being a rookie in the comp has stormed into the semi-finals, blowing past more fancied opponents like Comcast, Best Buy and Sony. If it can overcome AT&T in the sudden-death semi, it'll meet either Walmart or Bank of America for a shot at glory.